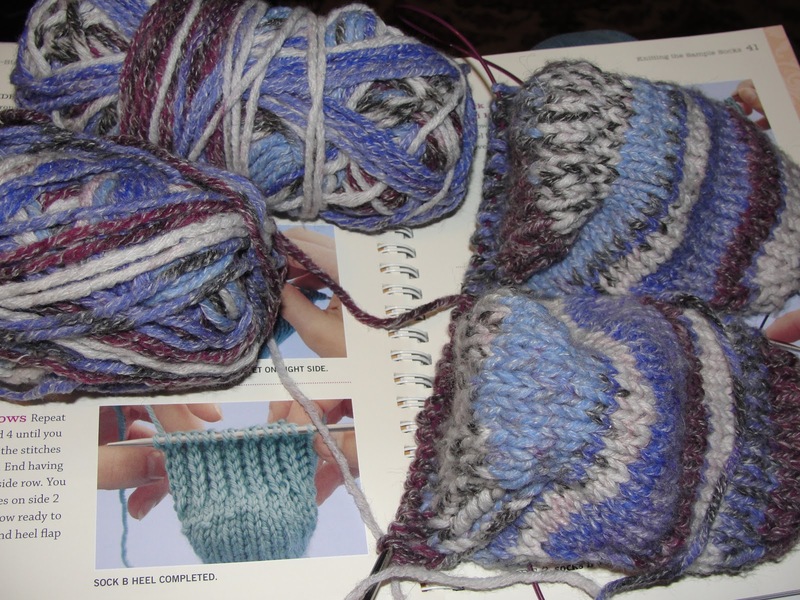 When I drew up my list of projects for this years Year of Projects Blog-a-long, I decided to include some knitted socks. I bought myself the book Toe-up 2-at-a-time Socks after reading Marie from Underground Crafter's review last year and then put it to one side until the mood struck. I was enthusiastic to join in Sarah's, Crafts from the Cwtch knitalong, as I had previously made two beautiful Veera shawls with the support of fellow knit-a-long-ers, so when socks were on the agenda, I knew that it was meant to be. I've started on the sample socks in this book, having never knitted socks before, I wanted to make two at a time...... as I am lazy like that. I cast on and after getting my head around moving the circulars back and forth, it seemed alright. I turned my first heel and thought....not so bad.....put the knitting down, picked it up tonight and have turned the second heel, but with a mistake....gggrrrrrr! Thank goodness these are only sample socks. I plan to finish these off quickly now as they are only samples and get on with something wearable! If you would like to see the patterns and progress of all the other knit-a-long-ers, then check out Crafts from the Cwtch link-up. Well that's the great thing about "sample" socks - you can get the mistakes out of the way early on. Great socks Faith, you sock knitters amaze me. Considering I can't knit to save my life I think those socks look very smart but difficult to do....two at a time?? My poor eldest sister has tried to teach me to knit many many times and I am useless at it. OMGosh, Faith...you had me crackin' up - "as I am lazy like that." Keepin' it real girl! I was gonna say boy, you are fast! Smart of you to try sample socks first to test the waters. You'll get. Mistakes are how we learn. I joined her group too but have tried 3 times to cast on and for some reason I'm getting twisted and I can't figure out how...I've evidently learned nothing but then I look at the pair I knitted and scratch my head! LOL! I think I'm going to order a circular with a cord that doesn't "curl"....it drives me crazy! Also, DPN's since it a goal to learn how to use them also. You are doing great! You go girl! P.S. How do you get your favorite blogs with their latest post and picture on the right side of your blog? I use blogspot too so it should be the same whatever it is. Thanks if you can help me. Toodles! Your socks look great - and I'm interested to see that there's more than one 2-at-a-time method out there (I only knew about the other way, where one sock is inside the other - which frankly seems like lunacy to me or an invitation to disaster). I like the method you're using, as you can see them both at once. But are they in the round? Is it like Magic Loop knitting? I started with a chunky yarn too so as to get the technique down before I move to the really skinny yarn and needles the size of toothpicks. I'm going to enjoy watching all your progress. Have fun! They look awesome, I shall follow your progress as I'm keen to knit socks but as yet my knitting skill is not up to it! They look great Faith!! Can't wait to see them finished! You should have seen the mess I got into last night trying to put the two toes on the needles! Anyone who can knit socks is an ace knitter in my book! It's a great way to beat second sock syndrome! I have a friend who knits one sock inside the other ... edge of the seat knitting because one stitch out and when you finish the two will be knitted together and inseparable ... conjoined socks! Good morning Faith...I hope you're having fun knitting your socks this very chilly morning (and we definitely all need some of them at the moment...You must make good use of those lovely, warm samples too! )...Two at a time is a great idea...When I was in my teens and had to knit two of anything it often just didn't happen once I'd enjoyed seeing the first one finished but things have improved over the years I'm glad to say!...Looking forward to seeing all your new projects through 2013..
around the internet. Shame on Google for now not positioning this publish higher!